Western Old Town of Las Vegas located in Red Rock Canyon. If you are into cowboys or ever wondered what it would be like to be a part of the Old West, you’ll want to visit Bonnie Springs Ranch. Built in 1843, Bonnie Spring Ranch served as a stopping point (also known as a “Tent Town”) for travelers heading to California. In 1952, the ranch transformed into the current western-themed amusement park located in the Mojave Desert, below the Spring Mountains in the Red Rock Canyon area. Located about 40 minutes southwest of the Las Vegas Strip, the 115-acre ranch is a hidden gem within the Spring Mountain Range that has become a popular tourist attraction for all ages. 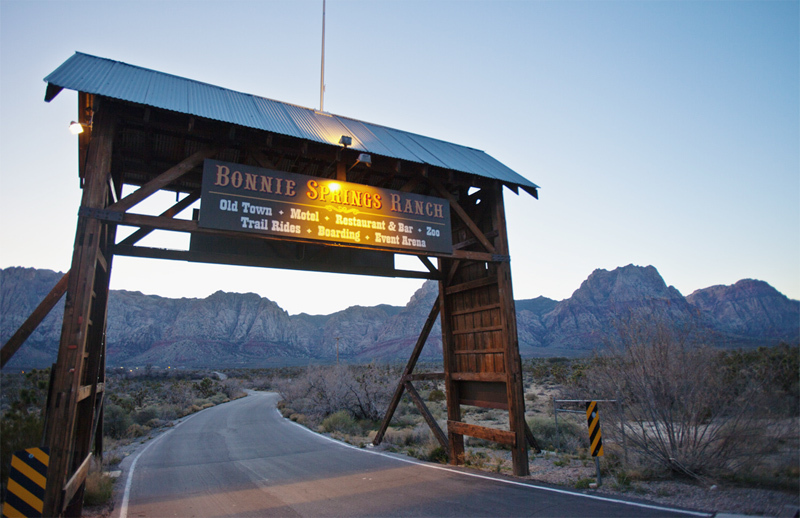 Bonnie Springs Ranch offers food, fun, and entertainment for the whole family such as Horseback riding, Live Shows, Gun fights, a wax museum, Shops and Snacks, a Wedding Chapel and a mini Train Ride on the weekends and holidays. Bonnie Spring Ranch it’s an awesome place to visit while you are in Las Vegas, this place it’s a replica of an old wild west town that will make you feel like if you traveled back in time. If you want to spend the a night or a week, Bonnie Spring Ranch has a 46-room Motel- Resort that is open all year long, and it includes Family Suites with Jacuzzi and Fireplace. There is also a Restaurant-Bar were you would be amazed by the old wild wild west decor. Bonnie Springs Ranch offers an interactive petting Zoo featuring a wide variety of native and exotic animals and visitors can catch a melodrama playing year-round. Participate in a hiss-and-boo skit inside the saloon, outside you can witness a staged gun fight and while the actors don’t use real ammunition, you may want to cover your ears because it still gets loud. Put your money in during a hanging. The criminal’s fate is in your hands. Show times are Wednesday through Sunday at noon, 1:30 p.m. and 2:15 p.m.
Saturday and Sunday, see a posse show at 1 p.m. and 3 p.m.
$5 on weekdays, $7 on weekends. This entry was posted in Amusement Park, Live Performances, Local Spots, Old Town, Vegas Classic and tagged Live performances, Old Town, Vegas Classics.